Wesley and Christian Hosie with the cheque to give to Children with leukaemia after their successful English Channel crossing record paddle. Well done boys! 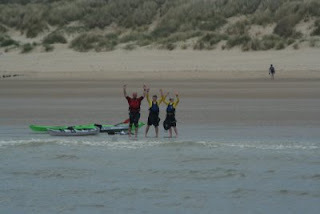 Hosie brothers make Channel crossing record! 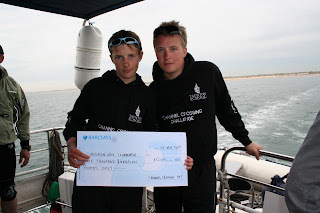 On Saturday 23rd May 2009 the brothers Wesley 19 and Christian Hosie 13 completed crossing the 25 mile English Channel to become the youngest ever paddlers to do so. In this achievement they also raised a whopping £5020.00 for Children with Leukaemia. The boys had a great support team including David Gardner on the water with them and the support boat team who have helped many Channel Swim teams lead by Mike Oram. 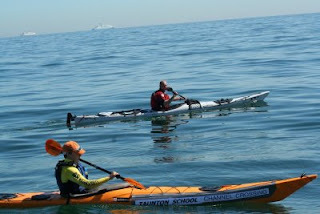 Wesley and Christian paddled the new Scorpio and Scorpio LV sea kayaks from P+H. 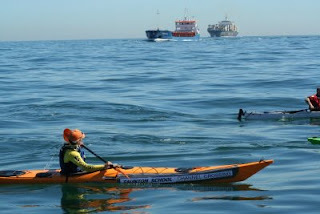 These boats were very kindly loaned from Pyranha and P+H for their training and crossing. 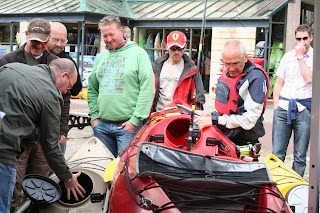 Support also came from Alder sports wear in rash vests and wetsuits and A.S Watersports supplied the rest of the kit, including Werner Shuna paddles and Palm Hydro Adventure pfd's. Talking to the BBC Wesley voiced his concerns about the busy shipping lane and the very Strong currents. Younger brother Christian said "I'll be able to look back on it and say I did that". Wesley added that they hoped for good weather which by looking at the pics you can see they got just that! 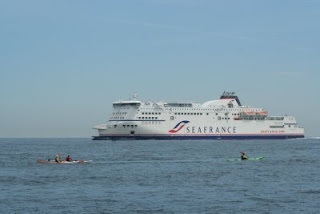 Looking pretty small against the Sea France ferry. This is one of the many dangers of a crossing like this. Congratulations and celebrations as the boys hit the shore in France. The crossing took just 6 hours which is a great time. We would like to give the boys a big well done for the achievement and for raising so much money for charity. We have finally received some of the new, and great looking, Sweet Wanderer Helmets. The Wanderer features the same great EPP liner found in the Rocker models, combined with a half-cut style outer made from high impact resistant injection molded ABS, with carbon fiber reinforced areas and direct venting for optimal ventilation and drainage. . The design is retro skate-style inspired, with features like the built in beak specially designed for whitewater use. The wanderer comes in three sizes, Small/Medium Medium/Large and Large/X-Large. If you have a small head you might be in luck, the Small really is quite small, even Ewart struggles to get it on his Pin Head! 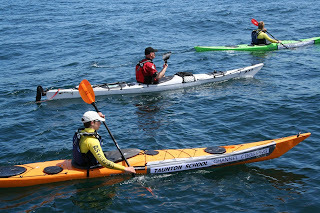 After the recent Kayak fishing demo day we have finally had an oppertunity to get out on some of the kayaks our selves. First up was the Native Manta Ray 14. I had paddled this before and was already sure of a few things. The Manta Ray 14 is fast, if a little heavy to get going. 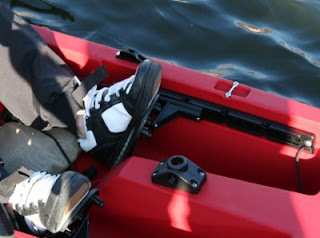 There is ample room in the cockpit for even the tallest paddler with plenty of adjustment on the sturdy foot rests. The back rest is very comfortable and every thing is in easy reach, getting to the hatch up front is not too tricky but a little wobbly. You do get used to this though. The very sturdy foot rests and Scotty rod holder base mount. This comes with the Bait caster attachment along with an Anchor system, the two flush mount rod holders, and bungs for all the scupper holes. The seconday stability on the Manta Ray is great. It will happily sit on edge with out wobbling. This is great in rough water. So over all a fast and stable fishing sit on top that can be used for some coastal touring as well. Dagger Europe have just sent us a press release about their new boat: The Axiom. Billed as a river runner that can do it all (within reason!). AXIOM, ALL RIVER? ALL RIGHT! An Axiom in mathematics is considered to be both a starting point from where other theories are proven and also something that is taken to be universally true. So when the Dagger R&D team sat down to design a boat to fill the shoes of the legendary RPM they had two considerations. One was to create something new - which others will no doubt follow. 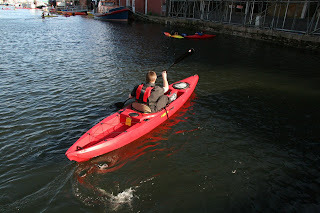 The other, to create a boat which would stand against the worlds best selling White Water kayak! They set off on a journey. Many opinions were given, many ideas tried and tested and many, many, hours later they decided that they had made…..An Axiom. Combining all river performance desired by experienced paddlers with forgiving and predictable characteristics required by those progressing the Axiom is a boat that will challenge everyone, at any age, to go out for more. Long enough for down river speed and excellent in surf the bow carries volume for smooth passage down river whilst the stern is cut low for pivot turns and agility. Using a flat planing hull, full-length rails and soft profile sidewalls the Axiom has a smooth transition from edge to edge and a playful feel. 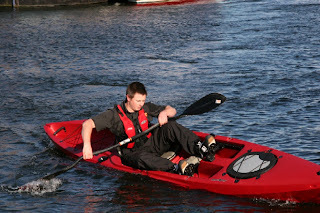 Inside its adjustable all the way with Daggers well loved River Running outfit system – solid, safe and very versatile. Available in four sizes the Axiom range features a super small 6.9 size ideal for aspiring young river runners right up to the 9.0 version giving a sporty boat to bigger paddlers. The Axiom - Start Something. We will have them in stock and ready for demo as soon as they are made. Kayak fishing demo day success. Saturday the 9th saw our first kayak fishing demo day and the official product launch of the new Perception Catch 390. We had a great day with good visitor numbers, lots of great products on show and good banter. Friends meeting up and new ones made. 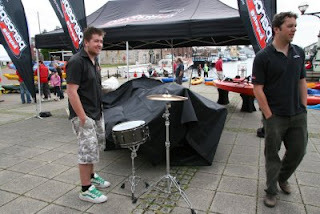 Perception's Matt Byom and A.S watersports rockstar in the making Sam. Getting ready to lay down a big drumroll for the unveiling of the Catch. With the covers off it was time to get a good look at the boat. The Catch comes with some great features such as the bow hatch, inside rod holders, a huge flat area in the front for dealing with your slippery fish and a soon to be available range of accessories. The boat it's self paddles well and is very stable. Based on the well known Gemini double the Catch is suitable for beginners and experts alike. It wasn't all about the Catch though. 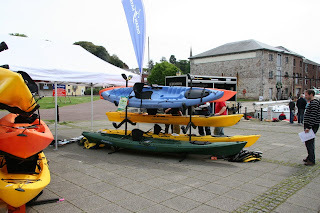 As ever the Ocean Kayak stand was very busy with the new Trident series being very popular. 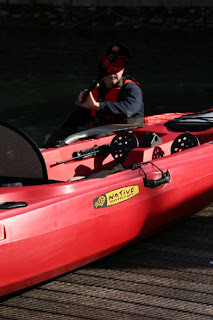 The other great brand of Fishing sit on top kayaks is Wilderness Systems. The new 2009 Tarpon range is beating all expectations and paddles great. A redesigned hull and completely new deck and out fitting make this a great choice for the serious angler. Almost all the boats here on the day are available for demo so just give us a call. That's right, We have just had our first shipment of Big Dog kayaks. On todays truck we have had both sizes of Kaos, the out and out freestyle machine and the Havoc, an awesome looking river running play boat. As soon as we have had a paddle we will post some pictures and reviews. 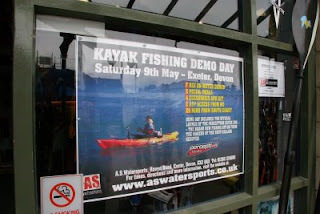 Just a quick reminder that it's our Fishing Kayak demo day this Saturday, the 9th of May, on the Piazza outside the shop. We will have a fleet of demo kayaks from Ocean kayak, Wilderness systems and Perception, as well as a range of Fishfinders from Hummin Bird. All of this is on top our our own demo range, which includes, Dagger, Islander, Pyranha, Perception, Native, Venture and many more. Plus it's also the UK launch of the all new Perception Catch 390 fishing Kayak. The last demo will be at 4pm. 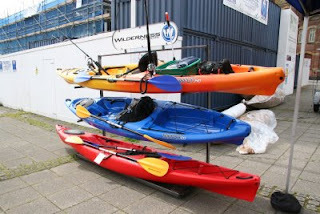 So if your interested in getting yourself a Fishing kayak this summer, or your already a hardened kayak fisherman thinking about the latest upgrade, then pop on down. But it's not just a show, there will be all sorts of goodies to buy as well. We have a shop and warehouse bulging with equipment! So if your just after a new rod holder, paddle, anchor, clothing, equipment or any other accessories, then why not come and check out our huge range of stock.